I place my object at 3 meters and want my Depth of Field to match in both cameras, holding focus from 2.5 to 4 meters. The shot wiill be screened in a 10 meter wide screen, via a digital 8K projector. The only post production work allowed is minimal color correction and uprezing of the HD image to 8k at the final stage, in order to avoid using the scaling machine of the projector server. At what f stop do I need to shoot on each camera to match DoF ? What are the circles of confusion you are using ? How did you choose them? What CoC are you using ? Oh and posting which lens you prefer here will have no effect on the outcome which has been gradually changing. Still need more votes otherwise the only way to find out which is which is to ask Carey at NAB as he's the only other person who knows. The point is that you need different CoC because you have a different native resolution. It's very straightforward and a fascinating read. There's a lengthy intro which may feel redundant to you; he gets into the meat of the issue about halfway through. CoC calculation, AFAIK, has to do with size of image plane diagonal, not with resolution. For example, film has no “resolution”. The different image plane is accommodated via crop factor. The 35mm FF reference CoC I used was 0.03. I used a 1.6 crop factor for S35. You did not specify whether it’s S35 3 perf or 4perf target area. Another slight deviation: DOF plane is 2.42m – 3.93m – close to what u wanted. I did this quickly on the fly, u can adjust as needed... or maybe my math was off... what is your result ? "CoC calculation, AFAIK, has to do with size of image plane diagonal, not with resolution." CoC is defined by magnification. The CoC is the smallest projected circle that cannot distinguished (by naked eye) from a single point. So we begin with a single recorded point (and this is not synonymous to a single pixel) but on the smaller sensor, in my hypothesis, we get 4 times the pixel count of the bigger sensor. That is per dimension, aka 16 times in total. In such a case I would think that the CoC for this case's S35 sensor might be significantly smaller than this case's FF35 sensor. Allow me to repeat that the S35 sensor would be 8K and FF would be HD only. When starting this thread I asked this question to optics experts. The reason was that the answer is really complicated. Thank our colleague for referring us through a link, I will study the document later. CoC calculation, AFAIK, has to do with size of image plane diagonal, not with resolution. I must admit I don’t fully understand the nature of your question but when calculating the stop difference to match DOF on different size sensors assuming the same aspect ratio you can use a simple formula. In our tests we used the 8k setting on the Monstro at 40.96mm and the 4.5K setting which is 23.04mm. Divide 40.96 by 23.04 and you get 1.78 stops. You could also use the diagonal measurement. Back to your question I imagine you are doing a thought experiment but in the real world nobody will ever build a HD or 1920x1080 FF35 sensor. This would be a pretty abysmal imager. Even back in the Dark Ages ten years ago did anybody ever build a 1920x1080 single chip camera? I know I am going off on a tangent but even the cheapest S35 cameras have relatively high resolution chips. These machines may have limited processing and recording so you cannot access the full resolution but only the downsampled version at 1920x1080. I can recommend this rather long video https://vimeo.com/248235757 from Panavision that discusses many of these topics including the value of capture resolution even over presentation resolution. again, CoC cannot be based on resolution (as you stated), as film has no resolution - but based on size (as you now seem to state yourself in your last post). Am I understanding you correctly that you assume the CoC changes based on the final display format ? Or why do you keep mentioning "screen size" ? For the FF HD I used a Canon 5D Mark II cropped to 1.78. P-Cam uses 0.00114 as CoC, needing a 16 stop to get your depth of field. Using pCAM I worked the focus split for the two sensor/lens combinations. I somewhat arbitrarily set the circle of confusion to the same 0.00049”… to see what an “apples to apples” comparison would be based on the projector resolution( magnification) as being the limiting factor. Obviously all other things are never equal - I would argue that the differences in acuity from different debayer choices and different manufacturers and different lens series makes this a “guestimate” at best… because perceived depth of field in an image is dependent on so many factors… but that is how I would go about the exercise. with a very soft image. So many variables in the real world. Steve Yedlin’s piece probably gives the most concise way of getting from A to B as a practical exercise… it’s pretty close to what I do when shooting, but I have to tweak things frequently when shooting vfx elements because I am rarely shooting an entire frame - more likely an element that does not encompass the entire depth of the scene. This really emphasizes the need to understand a question fully to provide the ‘right’ answer. In this case the word “match” is ambiguous and needs a little more clarification before you can get the answer you’re looking for. From an aesthetic perspective what’s most important in matching two plates (say a VV green screen shot and a location s35 shot) is the overall image and you shouldn’t be taking resolution, only the sensor size, into account to match by eye. If you are compositing multiple plates one would want the foreground and background defocused areas to look equally out of focus (proportional to the frame) in both shots, otherwise one actor will be incredibly out of focus while the person they’re talking to is perceptually much more in focus. You want the circl/bokeh to “match” in frame for two things at the same distance. But you also asked for the effective focus region to match. That’s a different “match” entirely and with the specs you listed would be mutually incompatible with the first form of “matching”. Without knowing what “matching DOF” means to you in the context of this question you’re going to get two very different answers. You’ll need to scale the CoC by gate\sensor size alone to match visually. You’ll need to scale the CoC by resolution and sensor size to match effective focus range (but accept that your images with any subject matter outside of the effective focus region will look very different). I would not recommend that video without a list of caveats. For instance they used sensor plane position instead of Entrance Pupil position when comparing perspective and as a result ended up with differing perspectives which they incorrectly attributed to the format change. It perpetuates the stubborn myth that faces look inherently different on different sensor sizes (which if true would have meant that decades of Vistavision VFX plates shouldn’t have matched.) It should be watched with the full knowledge that’s it’s more of a marketing than educational video. First I want to say that I would like to thank the OP for posting a very interesting question that raises a host of issues that don’t seem to have been resolved to me in the many worthy responses I’ve seen so far. I have recently been wondering just what CoC I should be using to calculate depth of field in video and it seems there are at least 3 variables. I’m guessing this is the most important as I imagine ( though I could be wrong) that classic 35mm DOF tables were based on typical cinematic projection. If I am shooting on a Monster but releasing on a web page ( as is more often the case than any of us want to admit) I should have a hell of a lot more perceived DOF than if its going to end up on an IMAX screen. So just calculating a DOF without knowing the screen size seems pointless. This would classically have been the critical factor since say in 16mm we needed a much wider lens than in 35 for the same DOF but frankly I can’t recall if there was much difference between DOF in 16mm or 35 with the same lens and F stop,. 3- Pixel density - well that’s a new one isn’t it. Does that affect anything? I would love to see a clear discussion of how these parameters ( or any others) weigh against each other. Screen size used to be the shorthand measure as there was an assumed resolving power & magnification of film projection and another much lower resolving power & magnification for what was then broadcast SD TV. This has changed now, as people can watch a curved 40” 4K computer monitor at home from a distance of less than two feet. This will show higher acuity than a decent movie projection from the front row. An from the original question, the idea that a FF-captured HD image will be uprezzed somehow to 8K projection really throws everything out the window. Uprezzed how? Will there be some dithering and smoothing or will pixels simply be repeated to fill out the resolution? The moment this was introduced to the mix it pretty much tossed the comparison out on its ear. As to one person’s question if any company had ever actually bothered making a Full Frame 35mm chip that’s only HD resolution, the answer is yes. Vision Research had some super high speed industrial cameras with enormous photosites and that oddball low light Canon is FFHD. Nobody knows the final delivery "screen size", since there are too many and you cannot control how the audience watches your content. In addition, IF (!) - and that is a BIG IF - there would be a drastic shift/change in perceived DOF based on the viewing medium, then that would not only encompass screen size but also screen technology, as Mitch already partially mentioned. And there are plenty of different screen technologies, and then manufacturer deviations., etc etc etc... And then there is viewing environment, which obviously also has an impact. I would like to see the equation for all of that. Once you start going down that rabbit hole, there is literally no end. Sure your circle of confusion diameter might be smaller than a pixel on your capture medium, but what if it’s half in one pixel and half in the other? You’ll no longer have a perfectly sharp pixel. And even if you did focus down to critical focus… you would end up with unwanted moire and aliasing, so camera manufacturers will throw on a low pass filter to soften the image anyway. And then you have to account for the contrast of the point, there’s always a couple pixels of glare. So even at critical focus with a theoretical 0.0000000001 micron CoC, the image on your sensor with enough contrast will still have some amount of halation and flaring, there will be some diffraction in the system. Ultimately all of these formulas and charts will narrow your focus on how to conduct the test, but nothing can substitute a good representative test. (If “representative” is even possible with the myriad of delivery formats available today). Mitch has a valid point here and I apologize for the insufficient explanation. In my imaginary situation (and I see now that I should have specified 2K instead of HD) the data are rewrapped so that each pixel is repeated four times to form an 8K image. The idea is that no resizing takes place inside the imaginary 8K projector, so that it delivers its native resolution. I am talking about theatrical screening, not monitoring of course. I imagine a spectator seating in a distance that will maximize perceived resolution. I have not calculated this, sorry. For all who simply divide the acquisition sensor diagonal by a number (eg 1500), I would say that this is irrational. If spatial resolution was the only form available we would probably have been forced to use a CoC almost four times larger for the FF 2K image. But temporal resolution leans in also. And Ceteris Paribus is not valid anymore. One can control acquisition, and the DOF calculations for that work. Everything afterwards is not in our hands. curious to see what Argyris finds out, since he said he has a white paper from some optical experts. For all who simply divide the acquisition sensor diagonal by a number (eg 1500), I would say that this is irrational. All DOF calculators use that formula. You can change adjust the number that you divide the image plane diag accordingly, if you feel you have "better working" value. clearly the DOF equations work, as they've been used for ~ 100 years and are being used every day. so what did the white paper state in regards to DOF impact of the viewing format ? 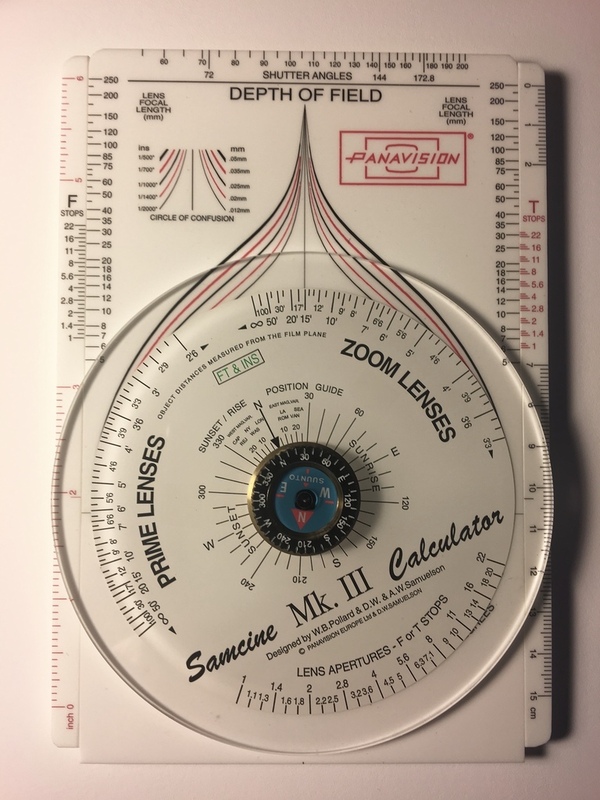 If you talk to some older, multi-format experienced focus pullers you will find that they (and by extension we) adjust COC #s until the tables, Kelly wheels, or calculators give us numbers that work for us in the real world for a given project. They are a starting point, but they are the easiest single variable to change in order to adjust our DOF calculations without having to create offsets. When we moved from film-to-telecine to digital HD camera-final color a number of focus pullers commented that the numbers weren’t working as strictly calculated, and there are a couple of different mechanisms likely in play to account for that. one of them is that there is a difference between sharpness (or acuity) and spatial resolution. When we were moving from photochemical to digital cameras for tiled HDR backgrounds, our tests of the early DSLRs showed that while they had a lower spatial resolution, the images looked sharper… a function of higher contrast at edges among other things. eg. The focus fall-off on a really high contrast lens looks steeper than with a slightly less contrasty lens. minimum viewing distances for jumbotrons, projected systems etc the display pixel pitch has to be below one arc minute to avoid detection… so you can work out minimum viewing distance to avoid seeing the standing pattern of the display pixels to get your closest viewing distance… not necessarily your most pleasing viewing distance, but that’s another story. Another discussion revolves around the difference between standing pattern and random pattern receptors…I won’t even go there right now. yes, absolutely. You adjust as needed. CoC is not hammered in stone, it is an adjustable parameter in the equation (and so are other things). but since CoC is a "moving target" (based on many factors, such as the ones you mentioned yourself) while the other parameters in the equation are not, it is IMO advisable to adjust what you know you have control over in order to get the DOF that you need - IF your shot setup allows that, obviously. Two months ago i had a similar problem, how to calculate easily DOF for different cameras, lenses, f,T/stops and print them. With a friend of mine created an excel file that did the job. 1. Culculate CoC diameter on specific distances, depending of focus distance. 5. Included a list with 33 cameras and modes. At least but not last is always possible to add new Cameras, CoC and lenses. >> Edit only GREEN cells. Argyris the CoC limit is by (Pocket AC). Screen dimension between 10-20m. * there is also some ,pdf examples. Theory and real world clash once again. Argyris, to calculate the CoC we inverse the fomulas of Near focus and Far focus and then we solve for CoC'. Please take a look at "formulas" tab. On the first tab, select camera, FOCUS DISTANCE, lens, f-T/stop, and all the distances you want to check CoC on the left column. I've just updated the "DOF - TWO LENSES CHECK" tab. Check out the Folder "_Argyris CML" on my link below. FF35 50mm T2 == S35 75mm T6.7 [DOF] .... Always exactly 2+1/2, T/stops and DOF maches. FF35 75mm T2.8 == S35 50mm T2 [DOF] .... Always exactly 1, T/stop and DOF maches. OK it appears my mind game confused things. Allow me to simplify it. Suppose we have two cameras (let's say S35) with equal sensor size but one is 2K resolution, the other is 8K. Suppose we use the same lens on both, and the lens' performance is ideal. Spectator has excellent vision and is seated at a distance that will allow him to fully resolve the 8K footage. So Ceteris Paribus the only difference is in sensor resolution. My guess is that the higher resolution camera will exhibit shallower depth of field. The question is how much? How does CoC change according to that? Now why do you believe the resolution would have to do anything with the depth of field, if it is based on sensor/film size, focus length, focal length and f-stop, upscalling it also has nothing to do with it. Depth of field as defined as ‘acceptable focus area’ will be larger with the lower resolution sensor but aesthetically, as a whole image, the depth of field characteristics will match. Your terms are ambiguous so the answer is too. The 2k will match(ish) a down sampled 8k image’s DOF. The background bokeh will be the same. You will see the image get softer than 8k on the 8k pipeline sooner and therefore define the acceptable focus region as smaller. It is not just sensor resolution but also projector resolution. You posit one complete system that is 2K and one complete system that is 8K. Assuming ALL other aspects are equal (a huge assumption), that OLPFs, signal compression, lens diffraction and EVERYTHING else do not contribute, then the 8K system will have a shallower Depth of Field as a smaller CoC is required. Also assuming that you need a full 8k detail within the entire acceptable focus range and that anything between 8k - 2k detail isn’t “acceptable” enough for some of the “acceptable focus range”. Considering 2k has been acceptable for cinema up to this point I think that’s also a huge assumption. The primary determinants of DOF are f:stop and subject size on the image plane. By subject size, is meant the literal actual size of the subject on the imager. For instance, if the subject is 8mm in height on a 35mm sensor and 8mm in height on a 65mm sensor, the the DOF will be identical provided the f:stop is the same and nothing else is changed. However, if you are positing that the subject on each sensor occupies the same percentage of the frame, say 50%, then there will be less DOF with the larger sensor. That is not a function of DOF, but image magnification. neither do lenses. A WA lens “appears” to have more DOF than a long lens simply because the subject is smaller. When the subject size is compensated for by moving the camera to match the subject size the the DOF will be identical, assuming the f:stop is the same, etc. Brian is of course correct, but in the given question of identical lenses in front of identical-sized sensors to identical-sized screens with the only difference being one is an end to end 2K and the other is end to end 8K, then resolving power comes into play as what we are really talking about is PERCEIVED resolution. This is all a question of when you can tell when something falls out of focus, meaning the point you can perceive the CoC of a point. A tighter grouping of pixels will allow for a tighter perception point, therefore a smaller CoC. Depth of Field is an illusion, and all imagery a fantasy concocted by our brains. In practice these differences are so minute as to be pointless. Contrasty lighting will affect perception of focus and Depth of Field more. Dancing on the head of a pin indeed. A WA lens “appears” to have more DOF than a long lens simply because the subject is smaller. Associated with this, the higher displayed resolution of the image the more apparent is the depth of field. Be it IMAX viewed from 60ft, a 70 inch screen in your living room or the use of virtual reality glasses. I know for head shots, it’s subjective and of course, the industry is naturally behind in conducting audience research. On a closeup, I think we have gone too far if one eye appears softer than the other. What does the audience think? I don’t think there is one fast rule and the answer is, as usual: “it depends”. You mentioned IMAX. Well, there are (or there shouldn’t be) any close-up shot on IMAX. Otherwise, 1/3 of the audience will be looking at left ear out of focus, the middle third will be looking at hair up the talent’s nose and the remaining third will be looking at right ear that is out of focus. When you shoot for IMAX, or Giant Screen in general, the framing is much, much wider and the deeper the DOF the better. Particularly that almost all IMAX is 3D. Deep DOF and presence of sharp detail are critical to perception of 3D. Conversely, when filming for mainstream cinema or television, there have been many shots that have paper thin DOF or even deliberately out of focus, which just make sense in the story telling. The delivery medium plays critical role to shot composition, framing, DOF, pacing and just about any other aspect of our craft. Pawel Achtel ACS B.Eng. (Hons) M.Sc. Location: S 42° 0'14.40"S, E 148°14'47.13"
I think one eye not appearing softer than the other is nigh impossible on a modern closeup. My concern is more about which eye. The far (usually lit) eye seems to be the proper one, and that's the way I've always done it, but more recently I've seen some TV series go for the close eye and for some reason it's a bit disturbing. I'm not sure why. I feel the opposite. When I watch a film where the close-ups are focused on the far eye I find my left hand twitching trying to correct it. I always focus on the closer eye because for me that feels more natural. If a subject/actor is turned enough that their eyes aren’t both in focus, my eye will automatically want to connect with their eye that’s closest to camera. I wonder if there’s a psychological explanation for this. Yes I agree, and it made me unsettled in Call Me By Your Name, for example, when some of those shots were not in focus. Or I wanted them to pull focus back to the Left/Front of the face. 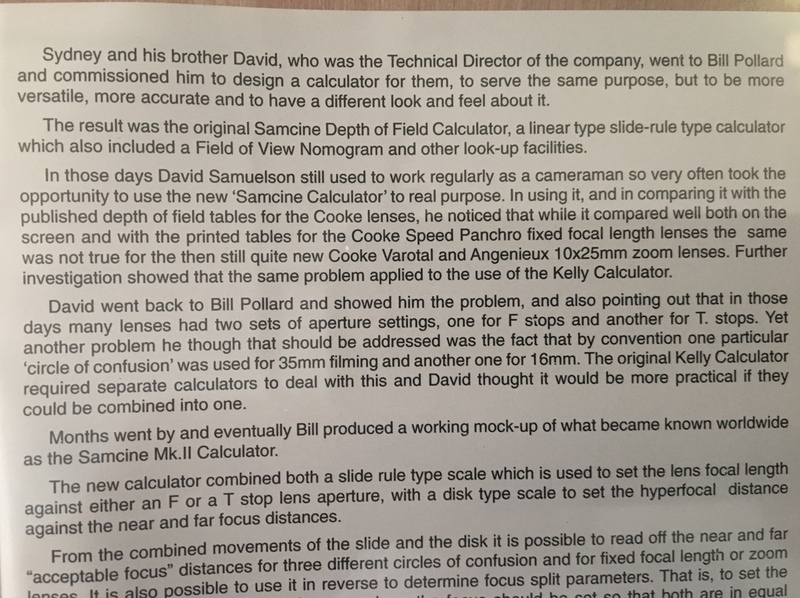 I’m going to try to find the original Instruction Manual for David Samuelson’s Depth of Field Test Rig. We built these for David when I was at OpTex. As David said, the rig was used to ‘explore’ DoF rather than simply to ‘measure’ it. We found that there were many different factors affecting it, some quite surprising. That would be wonderful to see again. There’s still one of these in available for use at Arri Rental in London, and I’m sure I’ve seen something similar at Panavision. Last time I saw one was at Clairmont Camera, now Keslow Camera. yes Mako, I remember it well. A useful tool for reality checking against the tables and charts. I wasn't commenting on the Brian Rose post but rather the thread and how long variations of this discussion have been going on. Are you sure you wish to delete this message from the message archives of cml-glass@cml.news? This cannot be undone. Report to Moderators I think this message isn't appropriate for our Group. The Group moderators are responsible for maintaining their community and can address these issues. Report to CML Support I think this violates the Terms of Service. This includes: harm to minors, violence or threats, harassment or privacy invasion, impersonation or misrepresentation, fraud or phishing.